Enjoy Europe's Best Value Skiing at our Friendly, Family Run Hotel. Come and spend your winter break at our family run Hotel and Chalets in a beautiful and serene location nestled at the base of the Bulgarian Rila Mountains. 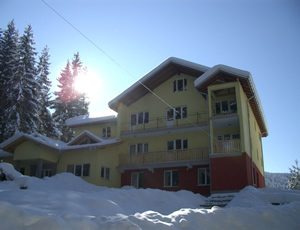 With breathtaking views of the valley and just a short distance from the lively Borovets Ski resort, this is affordable quality at its best. Enjoy the cosy lodge atmosphere with roaring fire, hearty meals and a fully stocked bar for après Ski relaxation and fun! If you thought a Ski break was always out of your budget – think again! With a number of budget airlines serving Sofia Airport, all you need to do is nab the bargain flight and leave the rest to us – we arrange everything else for you, with airport and resort transfers, ski hire, lift passes and instructed lessons, with no hidden costs. Our recently developed Hotel and Chalets are furnished to a high standard, offering comfort and cleanliness. We provide a continental breakfast and after a day on the slopes, you can return to a home-style three course evening meal, all prepared by a British cook using excellent quality local, seasonal produce followed by a satisfying and peaceful sleep. We are just a short transfer to the up-and-coming Borovets Ski resort, known to be one of the best value Ski resorts in Europe, with its 60 Km of pistes from nursery slopes to cross country tracks and thrilling red and black runs to suit every level of ability. We can easily cater for group bookings, and with our extensive local knowledge can arrange all sorts of activities – from night skiing, skidoo rides, spa days, tobogganing races, bonfire parties , games, walking routes and visits to local sites such as the Kings Palace. If there is anything else you wish to arrange, just let us know and we will do our best to accommodate!